Pope Pius VII, after he returned to Rome in 1815 from several years of captivity imposed by the emperor Napoleon Bonaparte, instituted this feast day in honor of the assistance which the Blessed Virgin had accorded the Church. The occasion of the Pope's exile and captivity was the emperor's resistance to the authority of the Vicar of Christ, superior before God to his own. A decree of the emperor in 1809 had ordered that the papal States be joined to the French empire; violence followed in Rome, when the French tricolor flag was set up and the papal arms broken. The Pope's very courageous bull of excommunication of the emperor was made public in the following month. Then, one morning, a group of armed men entered the Quirinal Palace by breaking down the doors with axes, and its leader announced that the pope must either renounce his sovereignty over Rome or be taken by the troop to a French General, who would communicate to him his next destination. The sacrilegious seizure of his person was executed, and he spent five years in exile in various places, finally at Fontainebleau, France. After 1815 the clemency of the great Pope towards the Emperor and his family is a matter of history; the latter were afforded a secure refuge in Rome itself, when Napoleon was exiled. And for the Emperor himself, relegated to the island of Saint Helena, the Pope pleaded for clemency with the Prince-Regent of England. When Napoleon died, it was with the assistance of chaplains sent to him by Pius VII. 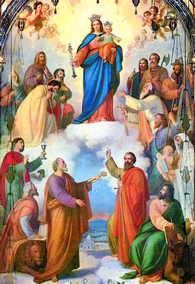 Our Lady, Help of Christians, was made better known by Saint John Bosco, who consecrated his Order of Salesian priests to Her. And in Turin, beginning in 1865, he began to raise in Her honor a vast and magnificent church. Without ever having a penny in advance, always the needed sums of money arrived in time. About three-fourths of the gifts offered were presented in thanksgiving for favors obtained through Her intercession. We will relate just one of those. A certain Senator of the Kingdom of Italy was ill; Don Bosco went to visit him and found him very discouraged and speaking of his imminent death. What would you do, said Don Bosco, if Our Lady Auxiliatrix obtained your cure from God? My cure! Well, I would give two thousand francs a month for Her church, for six months. Be of good courage, said the Saint on rising; I will see that prayers are said for you. Three days later, Baron Gotta, perfectly cured, went to Don Bosco to make his first payment, giving more than he had promised; and he did not cease to outdo himself in generosity. L'histoire ecclésiastique, by M. l'Abbé Darras (Louis Vivès: Paris, 1888), Vol. 40; Les deux intendants de la Providence à Turin (Joseph Cottolengo and Don Bosco) (Librairie St. Paul: Paris, 1904).